Bem vindo ao meu lugar favorito na terra. A propriedade tem 2 casas, totalmente autônomas e independentes. Casas de Santa Rita é um retiro rural localizado na região vinícola, no coração do Alentejo (a mais bela região não dominante de Portugal), na bonita vila histórica de Evoramonte, a 150 km de Lisboa, a 25 km de Évora e a 15 km de Estremoz. Em nossas casas (totalmente autônomas e independentes) é possível desconectar-se dos dias agitados e voltar a sentir a tranquilidade e a natureza. Nós levamos o conforto de nossos hóspedes muito a sério, e por essa razão nossas unidades de alojamento (quartos e casas) estão equipadas com tudo o que é necessário para uma estadia confortável. Lá fora, além do jardim, temos uma piscina com vista para um bosque de oliveiras, montanhas e o céu mais estrelado do mundo. Ideal para um descanso sério, leia os livros que você não teve tempo, ouça os pássaros, nade e observe as estrelas enquanto bebe uma garrafa de vinho e olha para um belo pôr do sol. A paisagem é uma combinação de oliveiras e sobreiros, e temos uma plantação de bagas de goji. 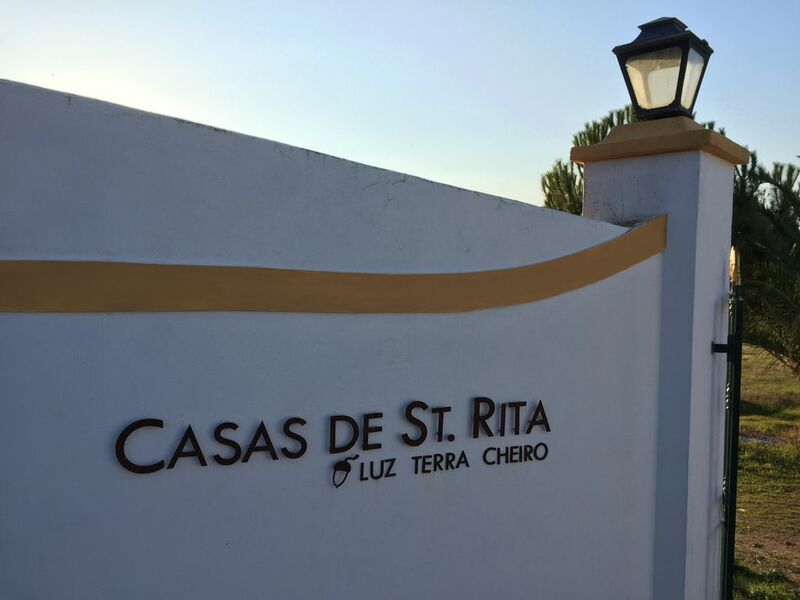 Excellent accommodation in the heart of Alentejo. Our stay was really great. The reception by the host Miguel was very friendly. The location is excellent for those who want to rest in the calm of Alentejo but it's easy to travel to some of Portugal's main historical sites: Évora; Estremoz; Vila Viçosa; Évoramonte; Arraiolos; Montemor-o-Novo, etc. The accommodations are nice and clean. The pool and the space around it are perfect for the summer. We spent 2 weeks at Miguel’s place and had a wonderful and stress free time thanks to miguel’s kindness and helpfulness. Évora Monte is a beautiful village and the surrounding is well preserved. The pool area is large and fantastic, just watch for tall people in the main house, state regulations prevented from changing the doors height. A great view and quiet place to be! Casa Santa Rita is a very nice place to spend your holiday! Beautiful surrounding and an amazing view at the castle of Evoramonte! We have spend our holiday here with our 2 girls (2, 6 years old) for the youngest one there was a babybed available! Miguel is also avery nice host and will help you where he can. In the future you can hire a another very nice house at the property. You will share the pool then, but it is big enough! We hope we will come back one day and hire that new place. We really recommend it!!! Très bien: bon accueil, calme et belle région. Jolie maison avec piscine. Cher Laurent, merci pour vos mots. A perfect place to relax, cool off and visit the surrounding sights. The House was beautiful in every way. Great style, comfortable and the stars! I have never seen so many. To have a leisurely coffee under the plant trellis, go out and explore the fantastic local medieval castle (no tourists) which can be seen from the house and pool. A comfortable distance to Estremoz and Evora's city sights and grab a lunch before heading back for a dip in the pool and enjoy some wine/port to wait for the emerging stars to appear. Quiet, peaceful, perfect. Thank you Miguel for all of your help and assistance. The honor bar by the pool was a great touch, we got a little low on wine and were able to purchase a bottle from your pool refrigerator instead of driving out to get more. Very thoughtful. Your new house is very beautiful as well, can't wait to return to try it out! Mrs Diane, It was a lovely pleasure to have met you and Doug. I will be waiting for the next chance to welcome you, Doug and the rest of the family. We (2 senior couples ) spent 5 nights at this well equipped property near Evoras. Our host was charming and helpful. There were a few minor drawbacks. The toilet in the master suite was abutting the vanity making it a challenge to actually use it but fortunately the third bathroom by the pool was a good alternative. The second bedroom was equipped with a 3/4 bed. Be sure the second couple are on very intimate terms. The third bedroom bunkbeds were suitable for kids. The pool was perfect for us. We could have spent the entire time at poolside. Overall excellent value. It was a good base for exploration of the area. Casas de Santa Rita é um retiro rural localizado na região vinícola, no coração do Alentejo, na bonita vila histórica de Evoramonte, a 150 km de Lisboa, a 25 km de Évora e a 15 km de Estremoz. Em nossas casas é possível se desconectar dos dias agitados e voltar a sentir a tranquilidade e a natureza. Nós levamos o conforto de nossos hóspedes muito a sério, e por essa razão nossas unidades de alojamento (quartos e casas) estão equipadas com tudo o que é necessário para uma estadia confortável. Lá fora, além do jardim, temos uma piscina com vista para um bosque de oliveiras, montanhas e o céu mais estrelado do mundo.